Azure Ultra Wins Another Award. These Are The 5 Reasons Why. We are delighted to announce that Azure Ultra has been selected by the prestigious Travel & Hospitality Awards as the winner for Destination Specialists of the Year 2019 for Malta. The judging panel at Travel & Hospitality Awards was particularly impressed with Azure Ultra's extensive range of packages and its impeccable online reviews. In fact, TripAdvisor also granted Azure Ultra a Certificate of Excellence for a third year in a row for constant five star reviews. The Travel & Hospitality judges noted Azure Ultra's excellent online reviews which highlight the professionalism and attention to detail of the crew. 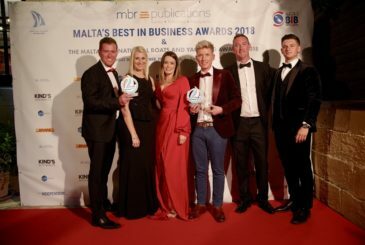 Perry Newton, Managing Director of Azure Ultra said, "I am delighted for the Azure Ultra team picking up this prestigious Travel & Hospitality Award for Destination Specialists for Malta this year. We are quickly amassing an array of travel awards and accreditation. It is a testament to the professionalism of our crew and the whole Azure Ultra business team. Our attention to detail is outstanding: we have a near-obsessive work ethic, as our online reputation has made known to all." "There are many reasons for our continued and growing success," added Perry. "Our extensive range of wedding and honeymoon packages and our corporate offerings are tantalisingly good. Then, there's also Azure Ultra Land and Sea Service which is, to put it frankly, unparalleled in Malta." The judges also highlighted our range of bespoke packages. Naturally, you only want the best service for your special occasions. 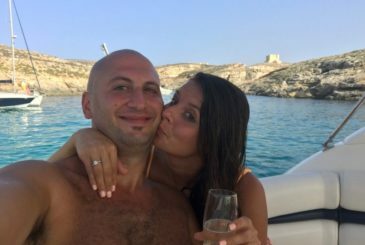 Azure Ultra specialises in personalised private functions: surprise marriage proposal dinners, hen and bachelor nights, yacht weddings, anniversary celebrations, vow renewal ceremonies, honeymoon charter holidays, and themed parties of all kinds. Many special memories have already been made aboard our yachts and we expect many more. A third highlight for the judges was our corporate offering. Malta's superior charter service caters for business activities and events. These include staff functions, team building activities, staff incentives, product launches, business meetings and lunches, client entertainment and more. Azure Ultra's yacht charter service provides the ideal setting for hosting customised events in ultimate Sunseeker luxury. Azure Ultra is also remarkable because the product is as outstanding as the standard of service. The fleet consists of four of the best boats out there, bringing you the best boating experience available with a yacht charter. The Sunseeker yacht is an icon within the world of motor yachting because it represents the epitome of beauty, luxury and function. With Azure Ultra, your complete luxury Mediterranean holiday experience can include a taste of the Maltese islands from both land and sea. Azure's original Land and Sea Specials service category combines a luxury yachting experience and a five-star on-land stay. Worth noting is that the Travel & Hospitality Awards 2018 for hotels in Malta was awarded to the Radisson Blu Resort & Spa Malta Golden Sands hotel, which is Azure Ultra's foremost partner for land and sea specials. Roger Jacobsen, first captain of Azure Ultra's fleet, feels proud. "The Azure Ultra team meticulously plans and delivers bespoke packages, often involving more than one boat. All the members of our professional crew and sales team love their jobs and strive for service excellence. 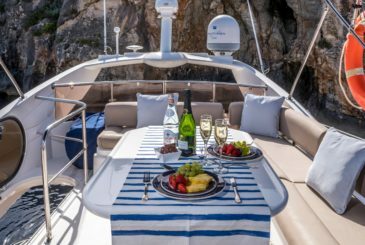 We ensure that our guests’ charter experience is always very, very special!" "Needless to say, we’re also extremely proud of achieving the TripAdvisor Certificate of Excellence yet again this year. Many of our clients are repeat guests who book well in advance. It’s fantastic that through their support and feedback, we have achieved this prestigious award – thank you so much!" Indeed, we can only thank you, our guests, for entrusting us with your special occasions and recommending us to others through your great reviews. Our success lies not only in our fantastic boats, packages and crew, it also lies in you. Discover the Azure Ultra experience. Contact us for more information.